Hey friends! I was tagged by my pal over at http://alwaysblabbing.blogspot.com/ to do the This or That Tag. I really enjoy reading these kind of post, so I am really glad to be doing my own. 3. Eyeliner or Mascara- Eyeliner is my absolute favorite. I have so many colors! 4. Bright or Dark- Dark like purples. Sometimes I go for light, it all depends on my mood! 4. Lush or other- I don't know! 5. Studs or dangling earrings- My earlobes have dangling earrings and my cartilidge have stud. 6. Necklace or bracelet- Can't decide, I wear both. 9. Jackets or hoodies - Jackets, wait does sweaters count? 5. Long or short- I am in the process of growing my hair back out, so long! 3. Fall or spring- Fall! I love the beautiful colors and the holidays! 4. Chocolate or Vanilla- Chocolate! I hope you all enjoyed reading this! 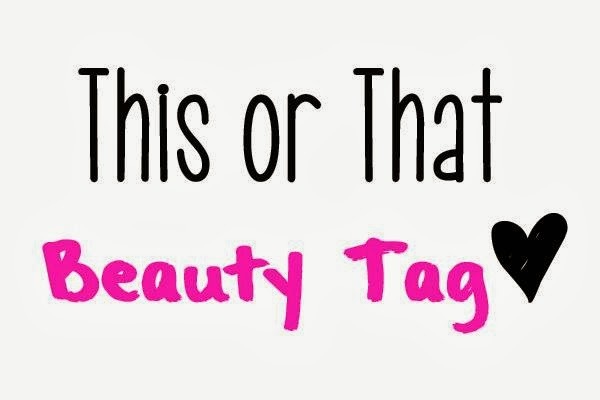 If I didn't tag you, I am tagging all of you to do this tag. It is really fun! Make a movie on yt!